Derrick Brooks, Tony Dungy and John Lynch are among the 15 finalists for the Pro Football Hall of Fame's Class of 2014. Inductees will be announced February 1. TAMPA, Fla. — Feb. 1 could prove to be a memorable day in Tampa Bay Buccaneers history. Then, the Pro Football Hall of Fame’s Class of 2014 will be revealed. 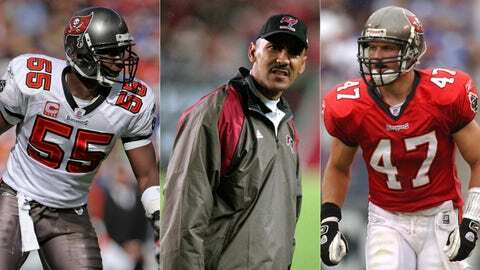 Three of the 15 modern-era finalists have significant Bucs ties: linebacker Derrick Brooks, the soul of Tampa Bay’s defense in the early 2000s; coach Tony Dungy, the man who gave life, starting in 1996, to a franchise that was lost for so long; and safety John Lynch, a hard-hitting presence in the secondary who offered attitude to a dangerous Bucs D.
Even wide receiver Tim Brown, a finalist for the fifth consecutive year, ended his 17-year career with one season in Tampa. For more insight into what this time of year is like for the Pro Football Hall of Fame — in addition to memories of earlier Bucs enshrinements — FOX Sports Florida spoke to Pete Fierle, who has worked at the Hall since 1988 and now serves as its manager of digital media/communications. Below are his thoughts before more men learn what it means to become a Hall of Famer. FOX SPORTS FLORIDA: What are you thoughts on all the Pro Football Hall of Fame finalists with Tampa Bay ties? FIERLE: We point out that someone is enshrined in one of three categories, and that’s a player, a coach or a contributor. And they aren’t really asked to declare or nor are they enshrined as a member of a team. That stated, we certainly do list all of our Hall of Famers under all the teams in which they’ve had a major impact. Having three of the 15 modern-era finalists having spent a major portion of their career with the Buccaneers and then having another cap off his legendary career in Tampa, that certainly says a lot for the franchise. As far as their impact, you don’t get to be a Hall of Fame finalist by not having an incredible impact on the game. Looking at the history of the game — when you look at who’s in this group — there’s a lot of scrutiny that’s put on the selection process, starting off with such a big list and getting down to the finalists where now we really hone in on what they’ve accomplished. Brooks, Dungy and Lynch are all in that room for the first time. They’re first-time finalists, and Tim Brown, of course, has been in that room discussed many, many years now. FOX SPORTS FLORIDA: What are your memories of the three finalists with large Bucs ties? 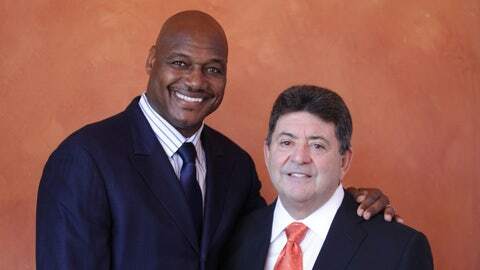 Looking to make a difference off the playing field, Pro Football Hall of Fame finalists Derrick Brooks and Eddie DeBartolo Jr. teammed up to start a charter school in North Tampa, Fla. to help students excel in a smaller educational setting. FIERLE: (On Derrick Brooks) He’s a finalist with good reason. I just think his impact, when you look at how the Buccaneers defense dominated the NFL for so long for that period of time, and then you look at the leaders of that (unit), no doubt Derrick Brooks was among them. From his (11) Pro Bowl selections, which you can argue may not be as important, but I also look at when you’re an All-Pro, and he was a (nine-time) All-Pro. That says a whole lot. I think also in the big games with that defense, him leading the way being Defensive Player of the Year (in 2002), being so much a major part of the team that won the Super Bowl — I think his impact on that franchise is really incredible. You look at some of those individuals who are enshrined in the Hall of Fame, and you see winning championships is a great measure, All-Pro (is a great measure), but helping turn around the fortunes of a franchise is huge." (On Tony Dungy) He came to the Buccaneers … that was not only a team that was really hurting, but (they had) double-digit losses in 12 of 13 seasons before he got there. Two years later, they finish 10-6 and entered the playoffs, and two years after that they got their first division title. He changed the fortunes of a franchise about as quickly as you can possibly expect. While he didn’t win the Super Bowl in Tampa, certainly he built the foundation in turning that team around. (On John Lynch) John Lynch is probably a little different than the other two in that he would represent a quality that you see in a lot of Hall of Famers that built Hall of Fame careers — and that’s perseverance, the idea that he didn’t really become a regular until his fourth year. And then to see how much of an impact he made, so he’s a great character of perseverance. And then once he got that opportunity to get in that starting lineup, he really became such a vital part of that Buccaneers defense, which ranked among the top in the NFL. You can point out a lot of stats … the idea that he’s credited with more than 1,000 tackles in his career is one number that really jumps out at me, and I would think would probably jump out to a lot on the selection committee. FOX SPORTS FLORIDA: How you ever seen anything like this with so many finalists who have shared backgrounds with one team? FIERLE: It is very unusual. … We opened in 1963, and the first three years that the Hall of Fame started inducting classes, there were three members of the Chicago Bears that were inducted in each of those classes. To kind of put an asterisk on it, we had 40 or 50 years of history to cover with our first few classes. But since that time, it is extremely rare. In fact, the most recent class, you have to go back to 2000. The 49ers had three members of their franchise enshrined that year: Ronnie Lott and Joe Montana were teammates, and then you had Dave Wilcox, who came from an era right before them. But to have three guys who were together on the same team at the same time is extremely unusual. FOX SPORTS FLORIDA: Is there an impact on voters at all with three members of one team being considered for enshrinement at the same time? FIERLE: I can’t really answer that question, because I’m not in the room when the committee debates. … I know there’s talk of when too many players from one team — there’s a lot of great teams, the Packers of the ’60s and the Steelers of the ’70s and then you get into 49ers and the Cowboys and talk about how many from a championship team should get in. But I think that Tampa Bay is fairly represented. You already have Lee Roy Selmon, who rightfully became the first in Canton, being the first draft pick, first Pro Bowl pick, helping them to great years in the beginning. Then you see Warren Sapp, who got in last year. He obviously had a major impact not only for the Buccaneers, but on the game, with so many sacks from a defensive tackle position. So I’d like to say that even though there are just two long-term Buccaneers enshrined in Canton, they’ve got good representation. When you look at these three guys all from the same team, being at different positions, I think sometimes there is a little more focus on that then being all together on the same team. FOX SPORTS FLORIDA: What are these weeks like for the Pro Football Hall of Fame? FIERLE: We’ve been in pretty high gear. Our selection process is almost year-round. As much of the Tampa media and a lot of the Tampa Bay Buccaneers fans found out last summer, the celebration that we have in Canton each year with the enshrinement is unlike anything in sports. That’s something that takes year-round planning. It’s such a huge event. As far as the selection process, two weeks after we finished our enshrinement last year, we started with the senior nominees. The modern era list came out in September and then in November, it was trimmed to 25 semifinalists. And then in January, we announced our finalists. So we’re preparing materials. We’re preparing for the meeting, and then we’re preparing for immediately after the Super Bowl. The day after the Super Bowl, we will have our executive staff meeting with the new class to prepare them for what’s going to happen between February and August when they come to Canton to be enshrined. It never really stops. It’s a pretty exciting time for us this year. For the first time, we’ll be introducing our new class on the "NFL Honors" show. That will happen on the eve of the Super Bowl. That will be huge and something new for us. This time of year is really exciting. It’s a playoff run for the teams, but for us, we’re pretty energized about what’s going to happen on Feb. 1. FOX SPORTS FLORIDA: What are your personal memories of the enshrinements for Lee Roy Selmon and Warren Sapp? FIERLE: I’ve been here long enough where I saw both of them. Last year was kind of fun for me, because as we were preparing for the media to come here … all the Tampa media kept referencing everything from when Lee Roy Selmon got in, and I constantly would explain to them that things are a lot different than they were when Lee Roy got enshrined. … When Lee Roy was here and enshrined in 1995, it was a far more intimate setting. It was on the front steps of the Hall of Fame. Now, it’s held inside the stadium with a grand stage that’s nationally televised, and it’s just night-and-day from the attention that it gets. What stands out a lot when I think back to Lee Roy is just having Dewey there with him — having a brother serve as (his presenter). They had been side-by-side throughout their lives and throughout their careers. And then when you get to the front step, and sitting behind you are the legends of the game, there’s not a person who has ever stepped to that podium who has not been emotionally impacted by how great it is. As much as they try to prepare for what that moment is like, they can’t imagine it until they get there. If you’ll recall last year, the same thing happened with Warren Sapp when he got on that stage. To hold his emotions in, it’s almost impossible.